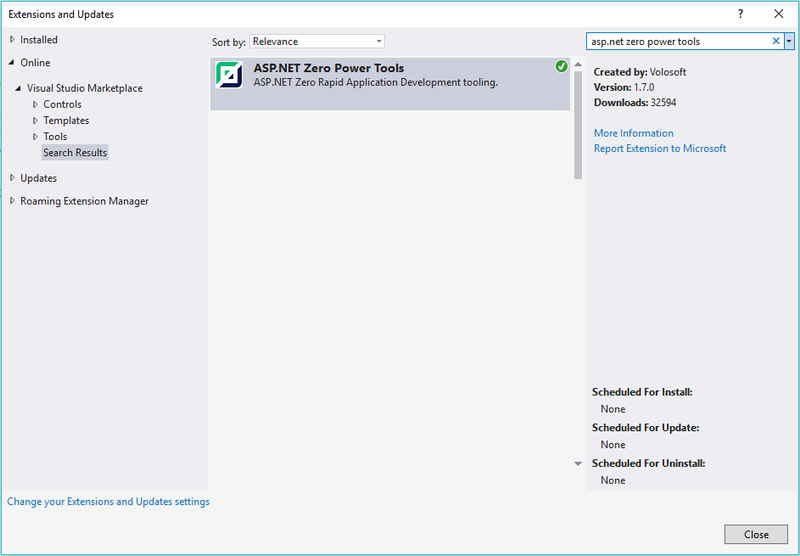 In this document, we will introduce ASP.NET Zero Power Tools and explain it. 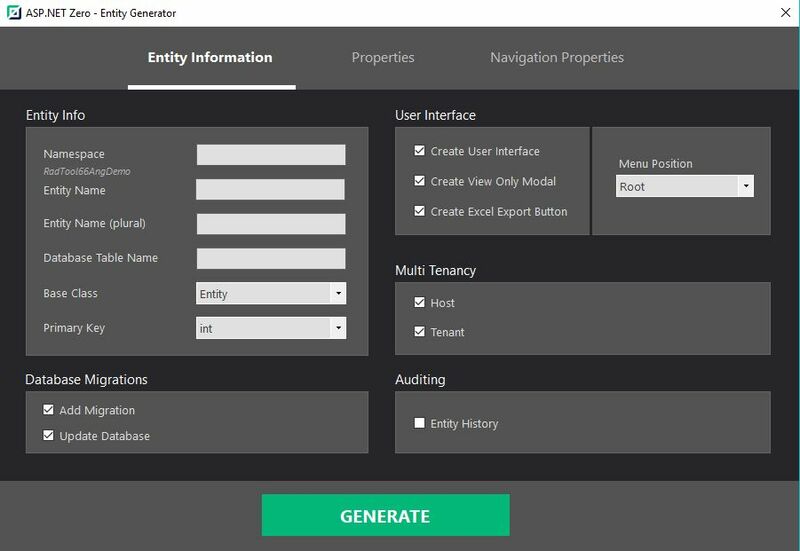 This tool is developed to minimize the effort of creating a new entity. 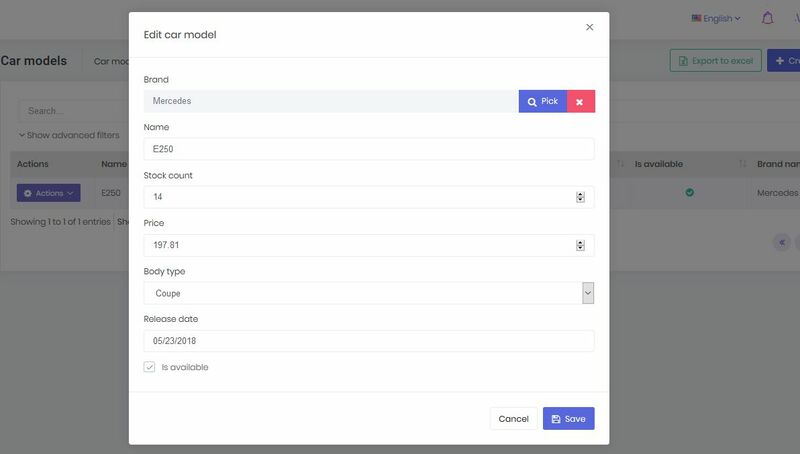 It creates all the related layers (including UI) by defining an entity. This tool supports v5.0.0 and later versions. If your project version is 5.1.0+, all you have to do is just install the ASP.NET Zero Power Tools extension on Visual Studio from marketplace or Extension and Updates. The extension can be found inside the Tools menu (Tools -> Asp.Net Zero -> Create An Entity). When you run it, you will see the interface for creating an entity. After carefully filling out the fields, press the Generate button to start the code generation process. A simple console will appear and give you information about the process. If there is no warning or failure, run your project to see the results. If you don't see the new page on UI, grant yourself the required permissions in the application. Warning: If you are working on ASP.NET Core & Angular template, after generating the entity via Power Tools, run your *.Web.Host project and then run "./angular/nswag/refresh.bat" to update service-proxies.ts. Warning: Be sure that you have saved your work before running this tool since it will add new files and modify some of the existing files. We strongly recommend using a source control system (like Git). Otherwise, backup your project. DLLs (that are inside the folder mentioned above) do all the work. The extension is just a user interface. This design is required, otherwise it would only be available for Visual Studio Windows users. However, since the tool is built on .NET Core platform, Mac or Linux users can safely use the tool. On Mac and Linux, you have to manually do some of the work that is done by the extension. This involves just creating a short and basic JSON file as input. How To Edit Pre-defined Templates Or Create A New Template? The templates are inside "/AspNetZeroRadTool/FileTemplates" directory in your project's root directory. Every template is split into three files: "MainTemplate.txt", "PartialTemplates.txt" and "TemplateInfo.txt". If you want to edit any file, just copy it in same directory and change it's extension to ".custom.txt" from ".txt". For example, you can create "MainTemplate.custom.txt" to override "MainTemplate.txt" in same directory. Please don't make any changes to the original templates. You can report your issues or ask questions on GitHub or support.aspnetzero.com. Here is the full list of the files that are created or modified by the tool, if you give a basic "Cars" entity as input.